They say great minds think alike, but sometimes it's more entertaining when they don't. Akira Toriyama: Creator of the world-famous Dragonball and long-time character designer for the Dragon Quest series. Masakazu Katsura: Creator of such classics as Video Girl Ai, DNA2, and the ongoing Zetman manga series as well as the character designer for the Tiger and Bunny anime series. These two manga juggernauts were on the ground floor of the golden age of Jump Comics and now, they've joined forces to bring the world Katsura Akira, a short story "collection" manga. That's "collection" in quotes, because the manga only really contains two stories. Katsura Akira is a pair of stories involving the "Galaxy Patrol," a space police force created by Toriyama. The first story, Sachie-chan Gu! is about a pair of individuals who are recruited by a desperate group of aliens to save them from a band of troublemakers. The second story, Jiya, is about a member of the Galaxy Patrol who comes to Earth in search of a fugitive, when he happens upon two Earthlings in trouble. The plot, manga layout, and character designs are by Toriyama, and the art is done by Katsura. The stories are fairly generic in content, but throughout the manga, you can see the talent of two seasoned veterans at work, having fun. It's quite interesting to see characters obviously designed in that familiar Toriyama taste drawn and moving about the page in the Katsura style. Both artists clearly have brought their A-game to the table while still remaining lighthearted and fun. While the stories are fun and enjoyable, perhaps the most engaging part of the manga is the afterword which involves an interview with both Toriyama and Katsura together, where you are given a sample of the chemistry the two artists share. Here is an excerpt from the interview, translated to English. Interviewer: Have you known each other long? Toriyama: Over 30 years now. My editor first showed me Kastura's Gakuen Butai 3 Parokan... The first time we met was at the Jump offices, right? You were wearing your school uniform. Kastura: No, no, you've got it mixed up. It was before I debuted. It was at the award ceremony when I won the runner up Tezuka award for Tenkousei wa Hensousei!? I wore a blazer, not a school uniform. Toriyama: ... Then who was that I met..? How old were you? Katsura: I was 19. At the time, the Dr. Slump anime was already started and we took a picture together – I was so nervous. I think it was when I started writing Wingman that we started talking on the phone. Toriyama: Yeah, we would babble on and on about stupid stuff. I tend to hate talking on the phone, but I'm fine when talking with Katsura or my wife. Even to this day. Katsura: I just thought of you as a quirky older fellow. (laughing) We'd end up talking for over 5 hours on a regular phone conversation. The worst was when I was writing Video Girl Ai. There was a time I'd call you every day. Katsura: It was probably escapism from the work. We'd talk until we had only 3 or so hours until our deadlines. I'm amazed you were able to put out Dragonball so regularly with such little time. Katsura Akira offers entertainment on multiple levels. From the main stories to the author interview and the rough sketches sprinkled between chapters, the entire manga is a joyride through the minds of two men who have dedicated their lives to creating manga. 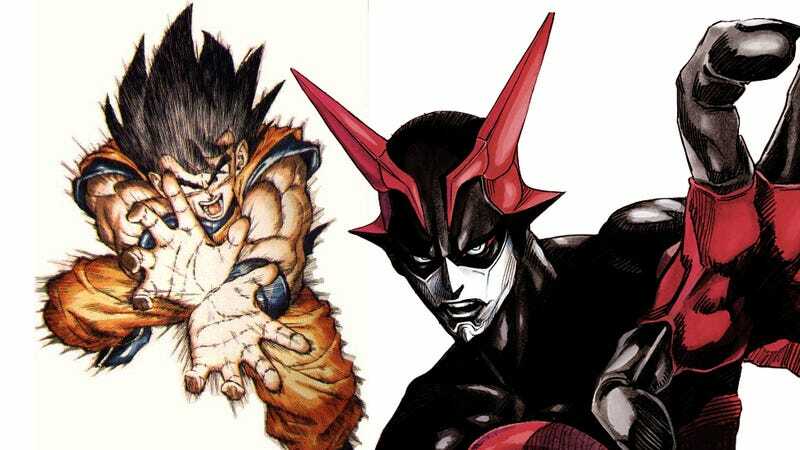 The manga is stand-alone, but there's no telling if the two manga giants might put their heads together and produce a sequel. While the stories themselves are not life-changing pieces of drama, they are enjoyable and of a proven quality honed by years of manga writing experience. All in all, the manga feels like a well put-together indie film with awesome special features, making the whole package well worth reading.